The golden age of the arcade game started in 1978 with the release of Space Invaders along with a cult phenomenon impact. Indeed, the invading alien hordes were the first ever iconic form of entertainment: thousands of hours of TV programs and hundreds of cultural exhibitions have been devoted to this generational icon of the 80’s which RJ-Romain Jerome encapsulated in its timepieces. 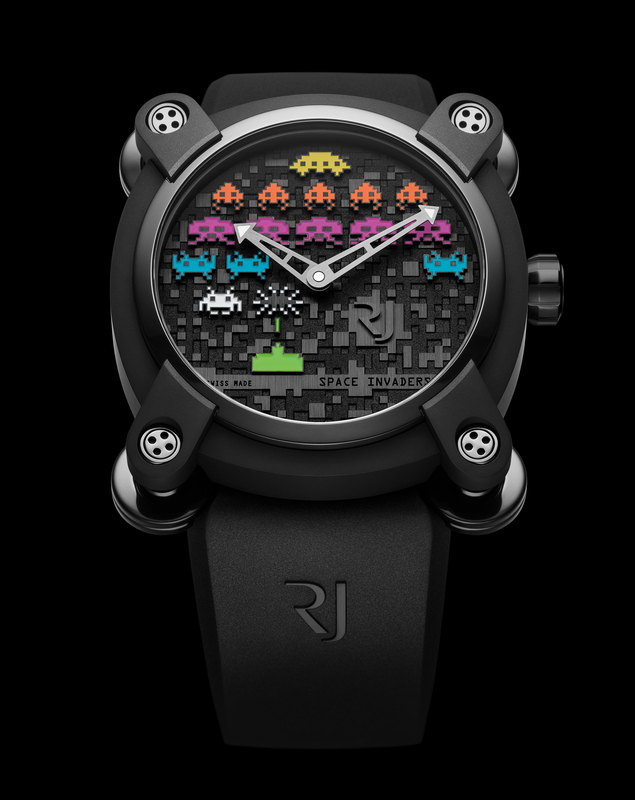 Six years ago, when RJ-Romain Jerome presented the first Space Invaders models, then launching a Games collection, little did everyone know that it would later become the brand’s biggest success. The collection consisted of two models, each limited to 78 pieces – echoing the game’s release year – and depicting the game’s famous scene illustrated in the dial, with coloured or white Super-LumiNova pixelated figures. Today, RJ-Romain Jerome is introducing a new collection with two models each limited to 78 pieces. The Space Invaders Pop is equipped with a Swiss Made mechanical self-winding movement. The watches are available in either a 46 mm titanium case or a 40 mm steel case, and the pair will be released simultaneously. The Moon Invader case features four functional ball-and-socket joints, cut like the pivoting “feet” of the lunar landing modules of the American lunar missions. These components hold the lugs of the rubber straps and enable the watch to adjust to all kinds of wrist sizes. The pixelated 3D dial with bead-blasted and satin-brushed levels reveal the famous Space Invaders characters enhanced with stronger and brighter colours. The characters, in form of a laser cannon and aliens, have been machined one by one then filled by hand with cold enamel in green, white, purple, blue, orange and yellow. These Pop colours are the game’s most representative colours used over time. New to the collection as well, the case back beholds a Space Invaders medallion standing in the middle of the stellar pattern extending to the black of the rubber strap. And to immerse completely into the Game universe, the watch box is designed like an arcade controller. This entry was posted in Uncategorized and tagged automatic movement, design, Men's Watch, RJ-Romain Jerome, swiss made, wristwatch by admin. Bookmark the permalink.